Crookwath Cottage Self-cateringA traditional Lakeland stone cottage set high up in the fells above Ullswater. Only the sounds of nature to nurture your soul set 350 meters above Matterdale in the very remote valley of Dowthwaite in the heart of the Lake District National Park. Walk directly onto the fells and leave the car behind for the week. The cottage has 3 bedrooms upstairs, with views of Gowbarrow Fell, Stybarrow Dodd and towards Helvellyn. The large sitting room and dining area dates back to the 17th century, it oozes character. With a traditional range used until the 1950's for cooking, boiling the water and cooking. There is Sky TV, video and stereo radio, as well as books and games. Traditional open wood burning range, with two sofas and two armchairs. Stunning views from all windows of Matterdale/Watermillock Fells. 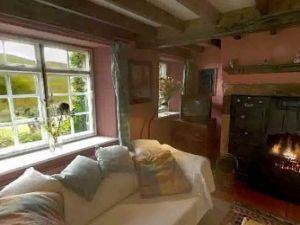 The hub of the cottage with its Aga and refectory table and sofa. Fitted with all mod cons, fridge, washing machine and microwave. Views out over Birkett and Stybarrow Dodd. Porch to garden. From the Penrith M6 roundabout - take the A66 towards Keswick. After approximately 8 miles look out for sign to A5091 Ullswater/Dockray/Troutbeck. Turn left, follow road for approximately 2 miles as it rises up a hill. Just over the brow of the hill, turn right signposted "Dowthwaitehead". This is a single-track road with a coniferous wood on the right. Follow for approximately 2 miles and go past a turning to the left signposted "Dockray". After 200 metres the road forks (there is a castellated water works building in the fork). Take the left fork, Crookwath Cottage is at the bottom of the hill on the right.